I went to Walmart tonight and noticed that they had 1/144 scale tanks. I wasn't impressed with the photos of the tanks. I was wondering if the tanks at Warmart would work? Absolutely. 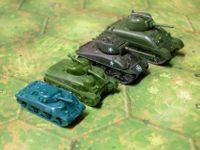 The Wal-mart ones are perfect for this game but 12 Shermans and 12 Tiger/PzIV will run you about $48 (I think they're $1.98 each). Axis & Allies:Minis also work very good with this game. They're slightly larger in size (1/120th) but have a much better variety of units. Flames of War minis start to border on being a bit too big for the hexes. The smallest might be considered around 8mm then perhaps 10mm for the 2nd. This makes those ones that you have seen to be close to it, so yeah, they'd be fine for that as well. While not super detailed, the ToI tanks appear to be much more detailed and historically accurate in appearance than M44. I have ToI but not M44, but I've played M44. Also, keep in mind ToI has a hex stacking limit: 3 units total, and never more than 2 vehicles per hex (a vehicle and a squad are both considered types of units). Last question, is there a sheet for values for different kinds of vehicles? Such as for a Jagdpanter and such?